Available in single row or multi-row configurations. Tapered roller bearings consist of an inner ring (cone), an outer ring (cup), a cage and rollers which are profiled to distribute the load evenly. They have high radial and axial (thrust) load capacities at low to intermediate speeds. 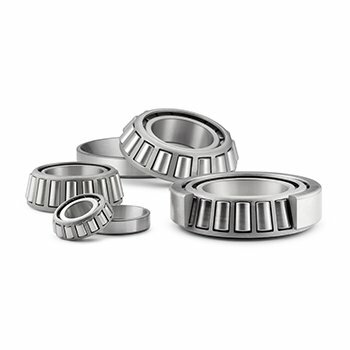 Tapered roller bearings are available in single-row, two-row and four-row designs. With single-row bearings, the thrust load capacity is about 60% of the radial capacity. Double-row bearings have a greater radial load capacity and can handle thrust loads in both directions. The rollers can be configured in such a way that the contact lines between the roller and the race converge or diverge towards the axis of rotation. Diverging double-row bearings increase the rigidity of the shaft mounting, while converging bearings do not. Other configurations for double-row bearings feature a single outer ring and two inner rings, or two outer rings and a single inner ring. Four-row tapered roller bearings consist of four rows of alternating converging and diverging rollers. The single-row tapered roller bearings are able to carry radial and axial load in one direction simultaneously. Because an axial component of force is produced when this type of bearing is loaded radially, two or more bearings are matched and used together. Bearings whose cup width, cup smaller inside diameter and contact angle are determined in accordance with ISO 355 specifications are identified by the supplementary code "J" as a suffix. Cone assemblies and the cups of such bearings are inter-changeable with those of bearings produced abroad if the bearing numbers are the same. These bearings are divided into the TDO type which has one double cup and two single-row cones, and the TDI type which has two single-row cups and one double cone. Both accommodate radial and axial loading in both directions. These two also carry moment loads; however, the TDO type is superior to the TDI type, because the distance between load centers is longer in the TDO type. The spacer of the TDO type, or the TDI type, pre-adjusts the internal clearance to provide proper operating clearance after mounting.